NTR is playing one of the lead roles in RRR, taking shape in the direction of Rajamouli. Recently there have been speculations making rounds that the actor will be seen in a new beefed up look in the movie and that some pics of NTR where he has put in some extra kilos are making rounds. 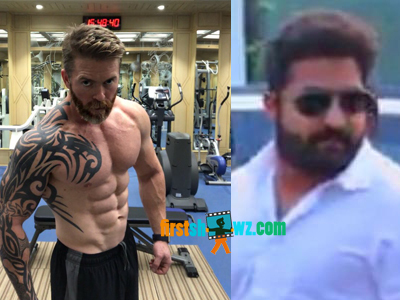 However celebrity fitness trainer Lloyd Stevens who is supervising NTR's look for the film tweeted, "Guys please note these pictures of @tarak9999 circulating around are over 1 year old, this is NOT his current look." NTR had begun shooting a fight sequence along with Ram Charan last month and the first schedule shoot is nearing a wrap. The second schedule of this DVV Entertainments movie will begin in 2019. Both the heroes looks will be different from their past films and we have to wait for long time for NTR and Ram Charan's looks in the flick.